I've pulled out my book I was working on last year. The one on depression that I ended up being too depressed to finish. I'm planning on self-publishing it through Amazon, both in a print and an ebook format. It will be a small book, 25,000 to 30,000 words. For reference, a novel is about 80,000 words long. I'm feeling a little overwhelmed with all the things I need to learn about formatting and publishing, including coming up with a good title and making a good cover. And then figuring out how to market it. I remember when I first started blogging, it seemed like a real learning curve. But I just kept looking up my questions and figured it out. I hope the same will be true here. But it almost seems like it will be more time-consuming than writing the book itself. I'm not sure why, but the title is giving me a hard time. I was originally thinking of something like From Darkness into Light. Until I looked that up on Amazon and saw a bunch of titles with the same name. But it will be impossible not to find a book title that hasn't been used somewhere by somebody. With 75,000 books being printed each year (!!! ), there's just not enough words out there. 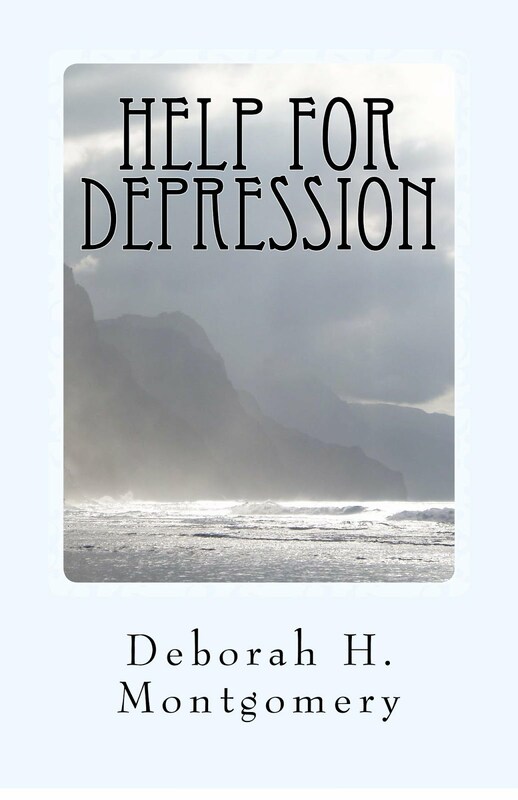 I want to have the word depression somewhere in the title, just so people can find it with their search engine. So maybe you can help me pick a title. A short description of the book first so you'll know what it's about . . . Imagine sitting across the table from a wise and compassionate friend, one who has walked the same path as you for years, one who understands what it is like to live with a depressive illness. 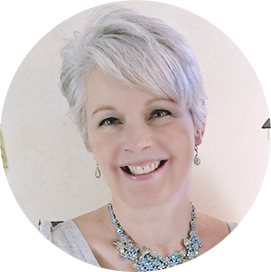 Listen as she shares her heart and gently listens to yours, encouraging you and offering practical steps to come out into the light of freedom and joy. 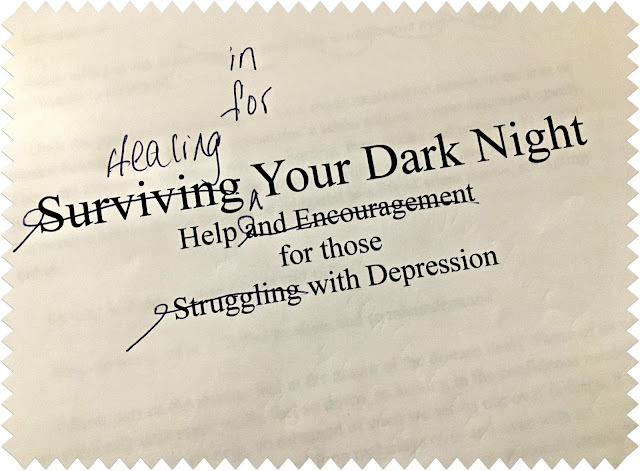 Covering the physical, emotional, and spiritual needs of those suffering from depression, discussing when and if mental health counseling and medication is appropriate, and offering the unique perspective of how beauty heals, here is a life-giving guide to help you through your own dark night. So here are some possible titles. Sigh. None of these seem very catchy. But I guess it's hard to find anything too exciting for a non-fiction book on depression. Which title speaks to you? Which would you want to read? Let me know what you think. I do think it's the ordinary, everyday, humdrum existence that can really show our character. When the baby's diaper needs changing again. When the cat has thrown up on the carpet again. When you have to cook dinner again. When the dishes need to be done, the laundry folded, the bed made, the thank you letter written. The groceries bought and put away. These are the boring necessities of life. That need to be done every day, or life can quickly fall apart. The things that no one recognizes unless they're not done. No one notices a clean toilet, but everyone will notice a dirty one. If we're honest, we all want to be part of, or be, the Big Deal. Get the attention. The spotlight. The thank you's for a fabulous achievement. It's the daily grind that can flatten us. The daily saying no to laziness and temptations. This is where we need to stay faithful. And just look at this . . .
Can you believe the difference?! I can't get over how much I'm loving this. I feel like we've moved to the country. So the next step is some more topsoil, grading, and extending the lawn back a bit. We'll leave the further back area au naturelle. I want to add some color by way of (shade-loving) perennials. Maybe the gardeners out there can give me some ideas.